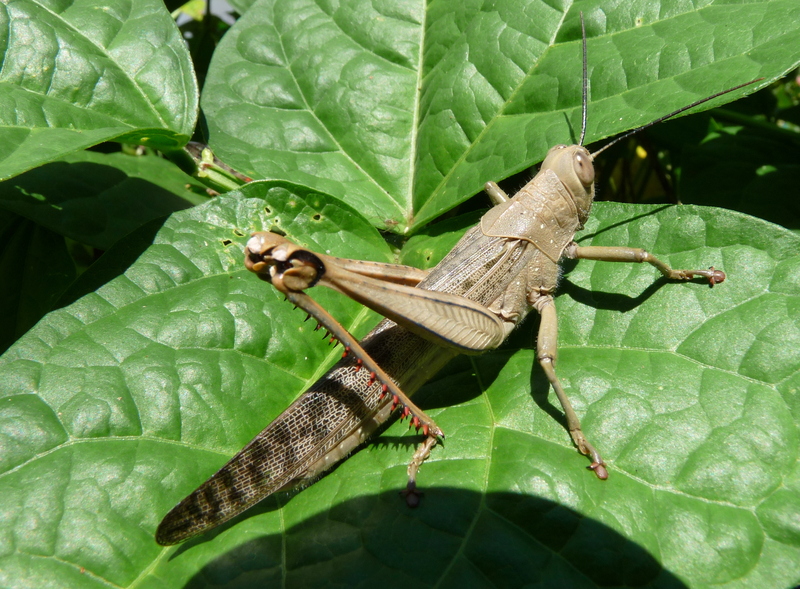 When picking beans this morning I was busily dodging the Green ants who live on the vine, doing a good job of keeping the bean fly away, when I noticed there were quite a few grasshoppers hiding on and amongst the leaves. They are, no doubt, enjoying some nutritious fresh, green bean leaves. I don’t usually worry too much about our vigorous bean vines but this crew may give them a bit of a beating so I’ll keep an eye on things. I may have to resort to some relocation! Given a chance these beans – a Dwarf Snake Bean and a Rattlesnake Bean – will keep growing through the wet season when many other vegetables struggle, although so far we’re still producing a good supply of capsicum, eggplant, shallots and an assortment of edible greens. 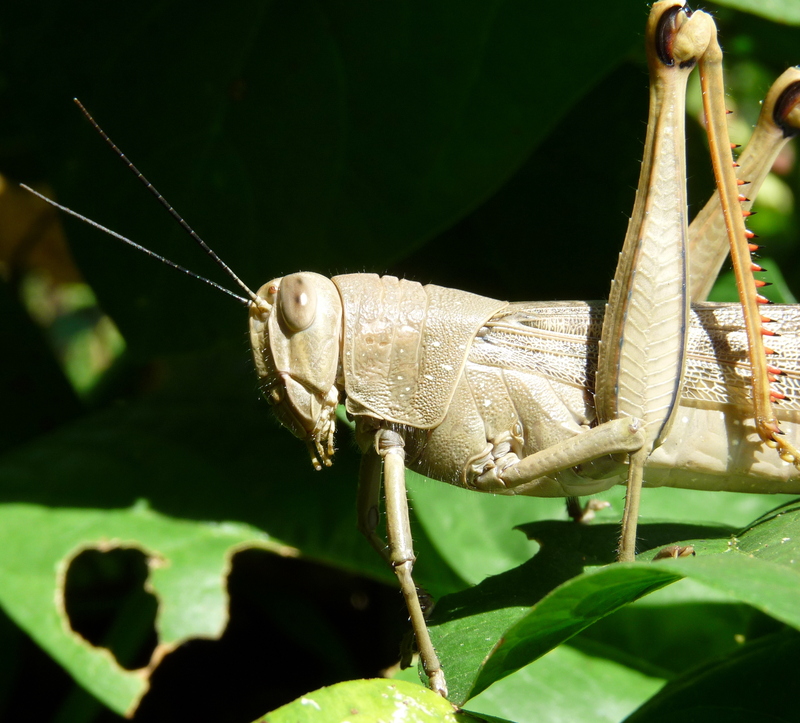 The bean leaf should give some idea of the size of this Giant Grasshopper, (Valanga irregularis). There is a lot more information available on the Brisbane Insects site including photos of nymphs of various sizes – many of which I noticed today. 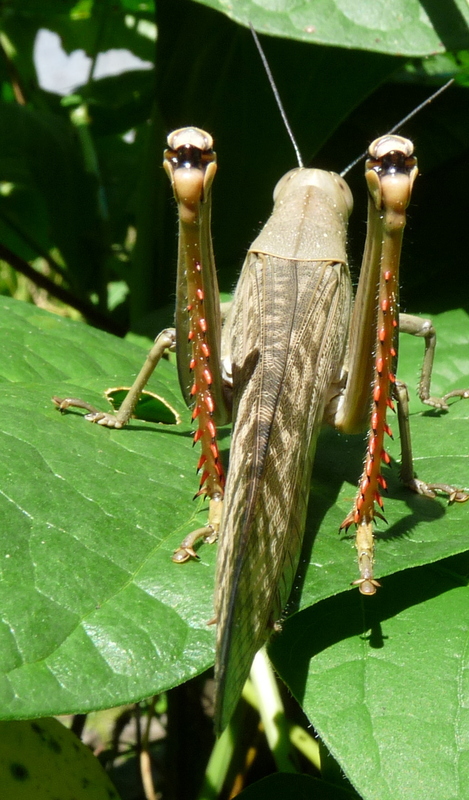 The back view, above, shows the spines on the back of the legs which they will use to defend themselves when necessary although their first defence when disturbed is to move into shadow under a leaf . Below; caught with a mouth full of green and some conspicuous holes in the leaf nearby! This entry was posted in Insect Life and tagged Valanga irregularis. Bookmark the permalink. That Brisbane Insects site is so handy. I particularly love that last shot. That’s definitely a guilty expression. I agree with both your comments – absolutely! Sad news, Grasshopper. Your post showing up as scrambled HTML. I’m sorry Venerable Master…. problem does not appear to be widespread and I hope is only temporary. When are you travelling north to take a decent photo of SWD? Old 2WD rusting out, eying AWD or 4WD then maybe SWDs in focus.